6.6" x 4.8" stitched on 14 count. 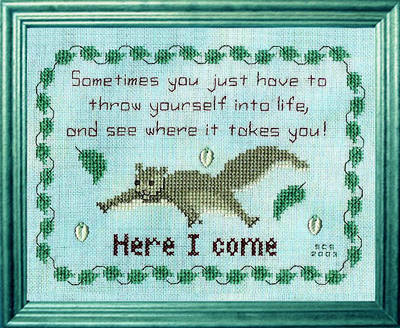 Throw Yourself Into Life cross stitch pattern... Sometimes you just have to throw yourself into life, and see where it takes you. A motto for lifes changing times. A flying squirrel is launching itself and flying free knowing that it can start again elsewhere. Below are words - Here I come.